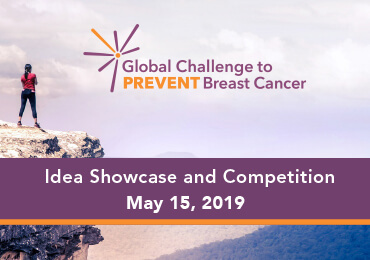 Last fall, the California Breast Cancer Research Program (CBCRP) launched the Global Challenge to Prevent Breast Cancer with a goal of surfacing transformative breast cancer prevention research ideas. The challenge’s Evaluation Panel has selected ten finalists from the numerous applications we received to compete in a live competition on May 15th in San Francisco, California. The event will take place at the Bechtel Conference Center at the Public Policy Institute of California in San Francisco from 9 am-12 pm PDT, followed by an optional light lunch from 12-1 pm. Join us for this event to hear some of the brightest thinking on breast cancer prevention research! Register to attend the event or view the livestream. Two Grand Prize winners (one advocate and one researcher) will be selected at the event, and CBCRP will also present an Audience Choice Award – we need your vote! The most promising ideas will frame CBCRP’s future funding strategy and will be further developed in California with $15 million in grant funding from the program. CBCRP also hopes the innovative ideas will stimulate other primary prevention research initiatives across the globe. To learn more about the challenge, go to www.ToPreventBreastCancer.org. If you have questions, please email us at Challenge@CABreastCancer.org.